I’ve yet to meet a fish taco I didn’t like, but I’ve met many a fish taco that left my voracious appetite seriously disappointed. At restaurants, I understand a mere taste is often the intention of the dish—deliberate bite-sized morsels of flavor to share an an appetizer amongst the table, amuse-bouche style. Usually I make do with my two gulps of fish taco, as I am also eating my body weight in guacamole on the side. 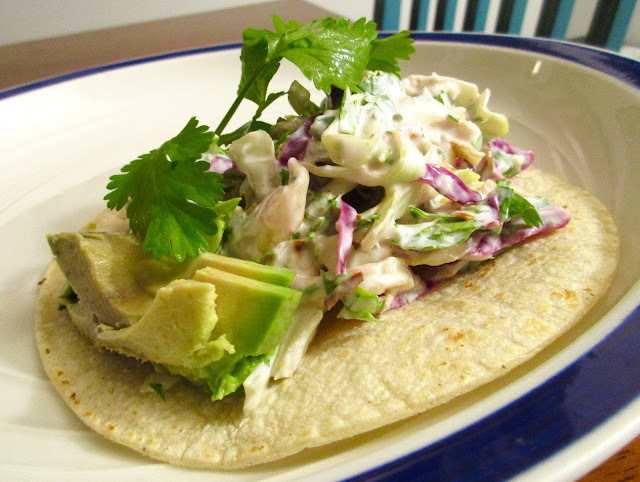 But sometimes, I just really want a substantive, filling fish taco for dinner. Not a pint-sized duo, or a trio, but like 12. Except with an average going rate of $7 a piece, 12 trendy NYC restaurant tacos would cost my projected craving a total of $84. Yikes! 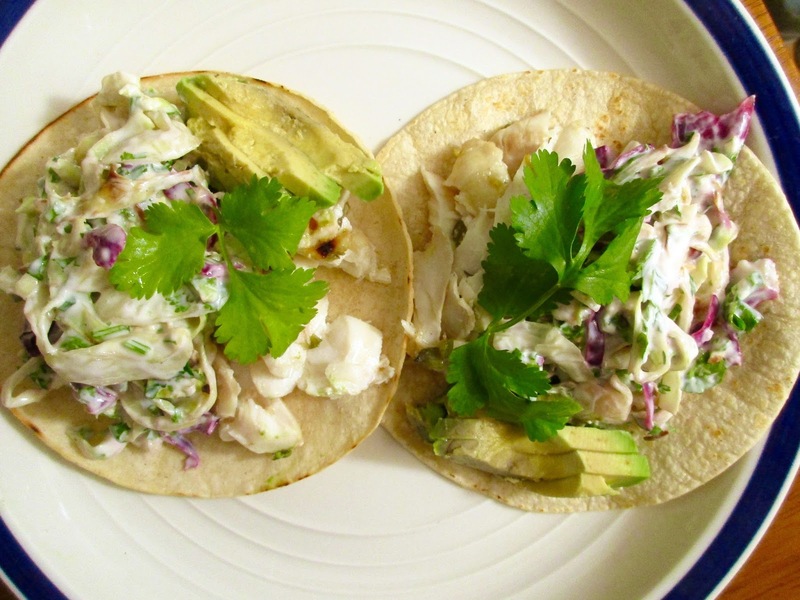 Enter tonight’s easy, budget, and hearty dinner: Fish Tacos with Creamy Cilantro-Lime Slaw. Fiber-packed cabbage and protein-rich Greek yogurt comprise the majority of ingredients in this zesty spicy slaw, promising true satiety with each heaping spoonful. The bright flavors jazz up whichever mild white fish you choose, but that’s not to say the fish is bland: most of the ingredients that give the slaw so much pizazz are repurposed to marinade the fish. Equally palatable is the weeknight dinner practicality of this dish, one of those under-30-minutes prep-and-serve types that is so appealing to the time-crunched cook. What’s key to these types of dinners is that they taste like they are true labors of love, i.e., big flavors that feel effortful, though are secretly effortless. These tacos fit the bill. Buying pre-shredded cabbage can help to expedite prep time, proactively multitasking helps in this department too. Prep both the slaw dressing and fish marinade simultaneously, so you can cook the fish (thinner slices of cod, tilapia or mahi mahi only need about 6 minutes in the pan) while you chop the scallions and cilantro to finish up the slaw. Two minutes before the fish is done, throw the tortillas in the microwave under a damp paper towel. (I prefer the Serious Eats tortilla-warming method, just know that it requires a second pan and 1-minute prep time per tortilla plus 5 minutes of steaming at the end. Good for small batches, more labor intensive for multiples). I like green chile salsas with a flaky white fish taco—right now, I’m partial to Trader Joe’s Hatch Valley Salsa, which pairs the peppers with tomatillos and lots of lime. Sliced avocado is another great add on, but just a few slices, no need to fill up on guacamole here! 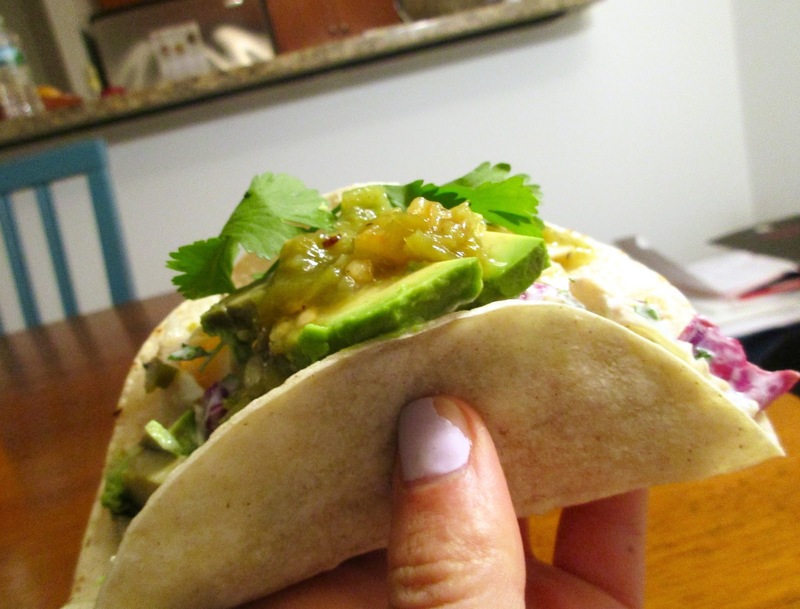 Perhaps you choose this taco recipe to ring in Cinco de Mayo? If so, a side of margaritas is certainly required. 1. Start the slaw dressing. Combine yogurt/mayo/sour cream, 3 Tbsp lime juice, grated lime peel, ¾ of serrano chile, 2 garlic cloves, and cumin in a large bowl. 2. Make the fish marinade. Combine rest of lime juice (1 Tbsp), rest of serrano chile, 1 garlic clove, and salt and pepper in a small bowl. 3. Cook the fish. Heat 1 Tbsp of olive, canola, or avocado oil in a nonstick skillet over medium heat. Rinse fish under cold water, pat dry with paper towels, and place in pan. Season with salt and pepper, pour marinade over fish. Cook for 3-4 minutes on each slide, until flesh is cooked through and flakes easily with a fork. 4. While the fish cooks, finish the slaw. Add scallions, cabbage, and cilantro to the large bowl. Mix thoroughly, season with salt and pepper, adjust seasonings to taste. 5. Heat corn tortillas in microwave or pan. 6. Assemble tacos to serve. 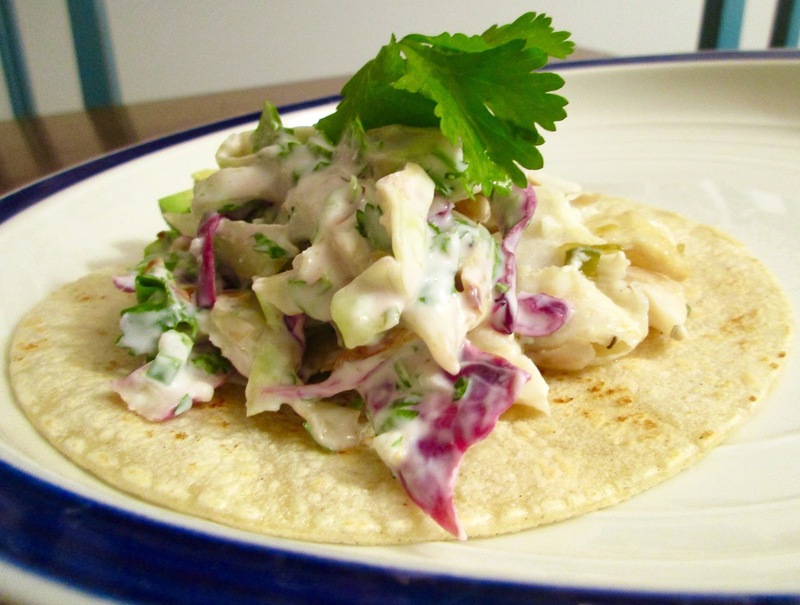 Distribute a small portion of fish and heaping spoonful of slaw over each flat tortilla. 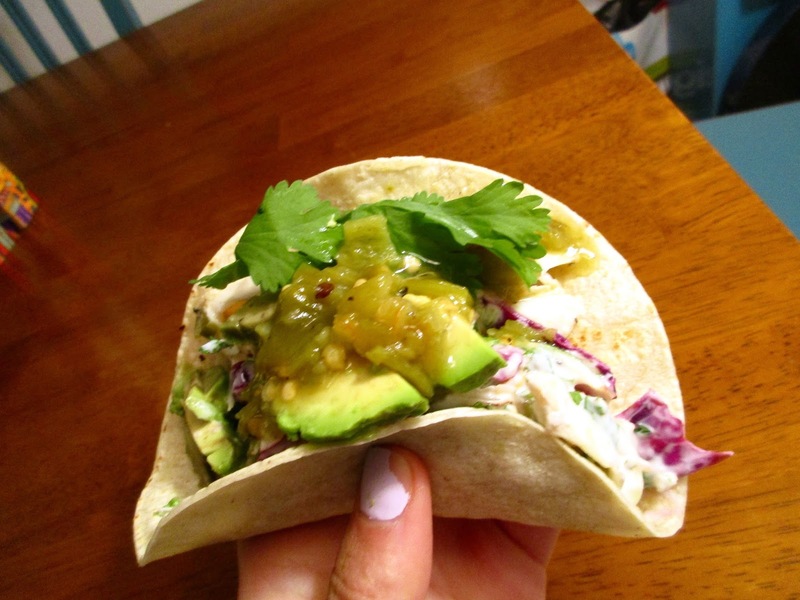 Add a dollop of salsa and a few slices of avocado. Garnish with extra lime juice or cilantro sprig just before serving.